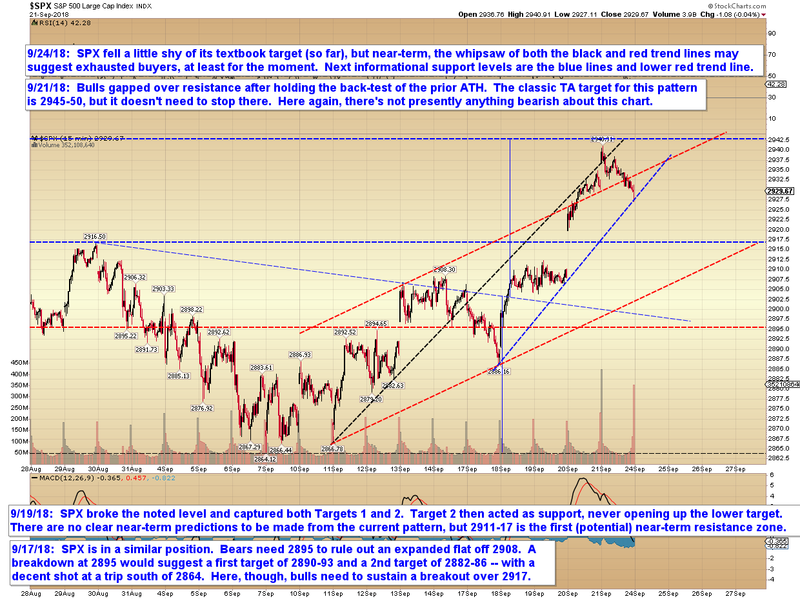 Last update looked like higher prices were still needed, but SPX reversed a little shy of its textbook target. I remain less-than-thrilled with this market overall. While the occasional clear near term pattern has emerged from this mess, the overarching big picture wave count can still go either way (B-wave high with a steep decline to follow vs. a bull wave that would probably need to exceed 3000). Neither of these two larger patterns looks much better than 50% right now, so when the near term turns messy (which has been often lately), there's nothing that provides a clear "tie-breaker" between one near-term pattern and the next. Accordingly, we're continuing to simply take it day by day until things clear up again. In conclusion, I always view it as a bit dangerous to overreach the market with one's projections. Either the charts justify a solid projection or they don't. At present, there's still an inordinate amount of noise in the charts, which is clouding the picture. Eventually that will clear, as it always does. Trade safe.